Bankstown Council is again hosting Bankstown Bites for the third year. This year's highlight are cooking demonstrations and book signings from celebrity chef Iain 'Huey' Hewitson. There are also eight food tours to choose from running at 10:30am, 12:30pm, and 2:30pm. I got to the Bankstown City Plaza around 10am. Since I'm relatively early, I get a free shopping bag filled with brochures and other goodies. The food tours have interesting names such as Wok It Up, European Eats, Tantalizing Tea, Sweet Treats, Little Lebanon, Know Your Noodle, etc. I'm a sucker for desserts, so I signed up my friend and me for the Sweet Treats tour. 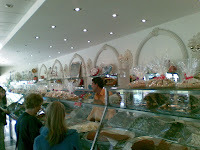 First stop is a Lebanese sweets shop a few block from the town center. The place is basically one long gallery of all kinds of sweets. They also make their own ice cream. The shop owner is pretty generous - everyone gets 2-3 scoops of ice cream and 2-3 kinds of sweets of your choice. We moved on to the cake shop on the next block. There's free hot chocolate for everyone, pastries, and a mini-takeaway package for everyone. Back at the town centre, we visited two more Chinese bakeries where they just plied us with cakes and cookies and pastries. My friend already gave up after the cake shop. We loitered around and watched Huey do a cooking demonstration. Had a quick lunch of fried rice and Filipino BBQ, then off to badminton.